You know that when Pia, Lucy and Lisa love a website, then it's going to be hot. And Concrete and Honey is hot, hot, hot! 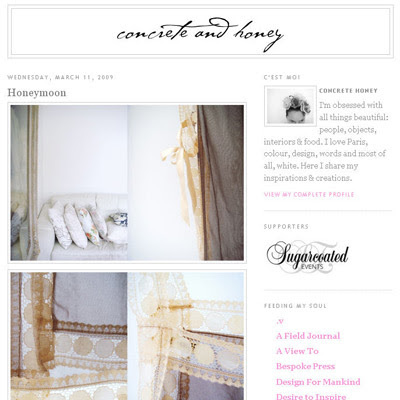 In only a few months since conception, Sydney-based Nicola has gathered a loyal following and been awarded a Blogger.com Blog of Note for 23rd March 2009 (Blogger picks one site from it's millions around the world to feature every day). Nicola features gorgeous, dreamy images to make your designer side swoon, including her own amazing photos of found objects and beautiful things around her. You'll find design ideas, interiors, and snapshots of Australia. I know you're going to love it. I just did a post on Nicola's home yesterday! She is fabulous! !